This happened in the first quarter in today’s North Texas-Arkansas game. 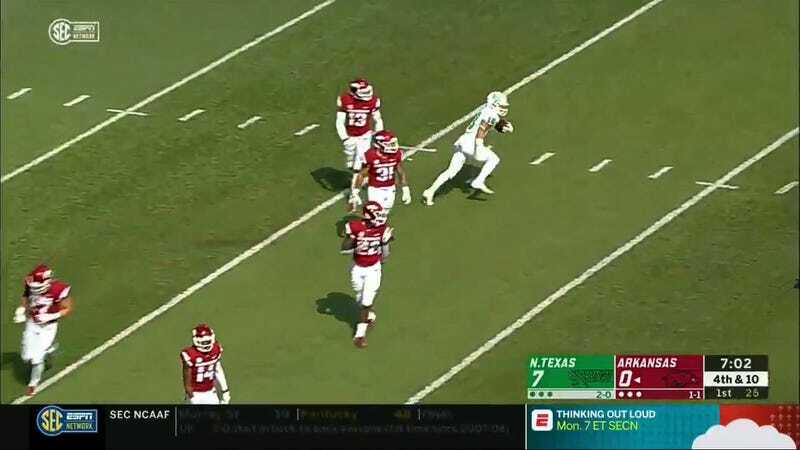 Arkansas punter Blake Johnson launched a low and knuckling punt to the North Texas 10 yard line, where it was fielded cleanly by Keegan Brewer, whose body language following the catch was that of a man who had no intention of attempting a return. The Arkansas punt team, having observed his apparent surrender, began making their way toward the sideline. Only the referees and Brewer apparently were aware that he hadn’t actually signaled for a fair catch! Oh no! Oh, yes. This is a play with some stakes! Brewer’s subterfuge involves appearing to give up on a play without having actually signaled a fair catch, leaving himself vulnerable to an attentive Arkansas gunner knocking him into next week. But it worked! North Texas’s 14-point lead was extended to 17 by the end of the quarter, and they now lead 24-10 in the second quarter.